An angry woman berated New York Gov. Andrew Cuomo (D.) while he was answering questions from reporters outside of a state police office on Wednesday. Cuomo had gone to the police office near the state Capitol after New York Daily News reporter Ken Lovett was arrested for using his cell phone in the New York Senate lobby, the Associated Press reported. Posted signs state that phone calls are prohibited in the lobby. Cuomo went to the police office and ordered Lovett's release. Free!!!! For the record, state police were very professional. After coming out of the office, Cuomo spoke with the press while standing next to Lovett. During the press conference, a woman also came out of the office behind Cuomo and started yelling that the police had pulled a rifle on her before. 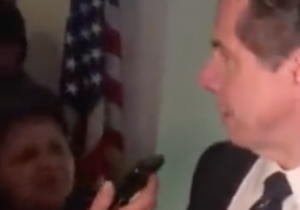 As Cuomo tried to continue to speak to the media, the woman became more hostile and yelled in Cuomo's face using several expletives. Multiple police officers then came from inside the office to take the woman into custody while Cuomo joked about Lovett's arrest.